We earlier reported that British actor Lauren J Irwin would be playing a prominent role in the pre-independence portion of Superstar Rajinikanth – KS Ravikumar’s Lingaa. Now we hear that British actor – director, William Orendorff will also be joining the team. Lingaa stars Anushka Shetty and Sonakshi Sinha as female leads, and has AR Rahman’s music. Is Santhanam A Part Of Superstar Rajinikanth – KS Ravikumar Project Lingaa? 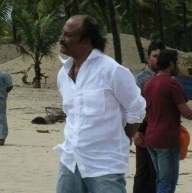 Is This Rajini's Period Look In KS Ravikumar Directorial Lingaa? People looking for online information on Ks ravikumar, Lingaa, Superstar Rajinikanth, William Orendorff will find this news story useful.